The wedding bubble is an interesting world to be in. When you're planning a wedding, you're well aware of the trends and the current practices. Sometimes it's easy to forget what you've actually encountered in your every day life versus read about hundreds of times before on the Internet. Wedding websites are one of those things where it seems like everyone has one. It's common practice in the wedding world; however, I personally have never been to a wedding where there was one. Since I recently started a business, I was just in the throws of website building. As someone who has been blogging for over five years, I know a thing or two about html and putting together a website. Moving over into wordpress.org was a big leap in skill level and after a few too many moments of frustration, I managed to build a self-hosted website I'm pretty proud of. 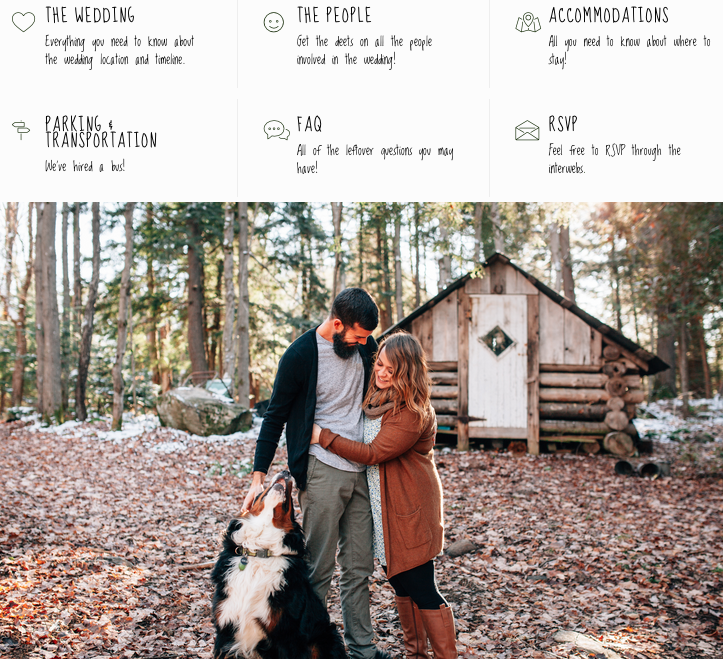 Our wedding is fairly atypical, and we really wanted an easy way to communicate with our guests beyond the detail card in our invitation suite (we've already explained everything to the grandparents in person). The pretty great thing about paying for a self-hosted site (I use bluehost), is that you're allowed unlimited websites. 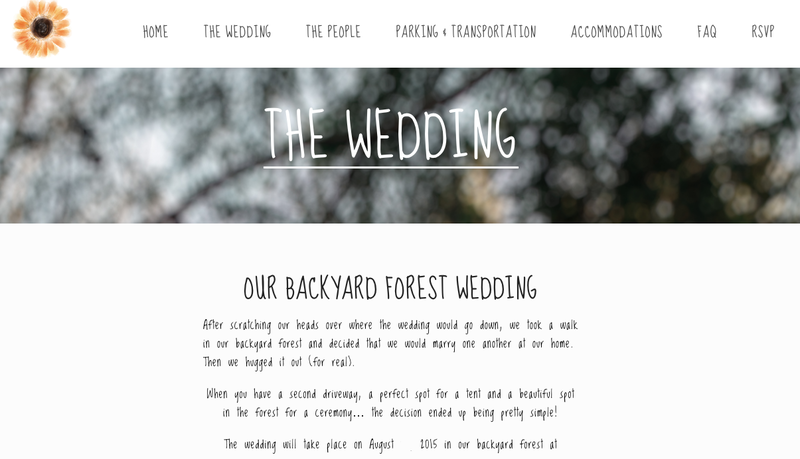 I purchased our wedding domain for $8 and got busy testing out a bunch of free templates for wordpress.org sites. When I was disappointed with how things were looking, I decided to test out the template* I had paid for already for my business site... and I loved the fun wedding version I was able to create! Having creative control over things has kind of been the best part of wedding planning for me. I have a creative brain, and being able to design our website with our brand was another fun task! I decided to break the website into six pages (beyond the home page) to cover everything we wanted to share with our guests before the big day. 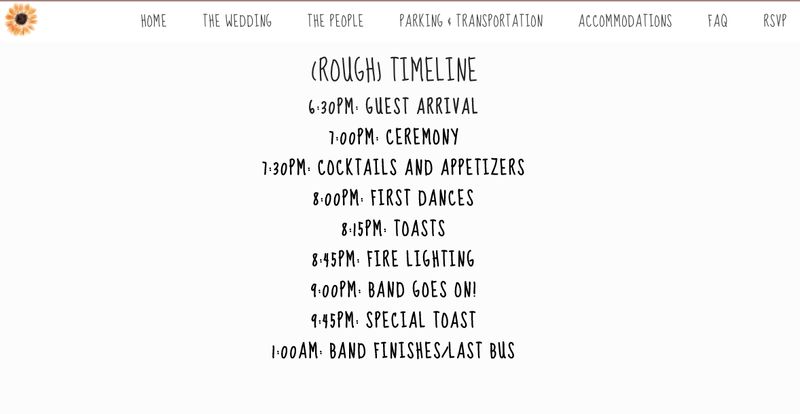 This section covers the location of the wedding and a rough timeline for our guests. This page simply gives a breakdown of the wedding party. Since we have limited parking and are encouraging our guests to hitch a ride with our hired bus, this section contains some crucial timeline and pickup information, as well as information on where to park for those that choose to drive. Currently a placeholder for our room block info (something that has been our official wedding nightmare - more on that soon). It also encourages our out-of-town guests to book early because of the Ironman in town. This section provides answers to common questions (e.g., what to wear, registry, open bar, etc.). I felt most comfortable keeping our registry information within the FAQ section versus on it's own page. After our formal invitations go out, we will open this section up for option of RSVPing online. What did you use your wedding website for? For some more technical information on building your own Wordpress website, be sure to check out Mrs. Hen's post. I found it very useful! *For the technically curious, the template is Pangaea from Theme Forest. I was also surprised to see it's significantly cheaper than when I purchased it!